It feels appropriate that The Diary of a Nobody should kick off the new King’s Head Theatre season in January. For how many nibs have been sharpened, fresh pages turned and inner-most thoughts committed to paper since the start of the year? And how many, begun with the best of intentions, are already gathering an unholy combination of dust and regret? That so many are abandoned is hardly surprising, for it takes a rare blend of solipsism and dedication to commit to the task of capturing your thoughts for posterity. The jeu d’esprit of the professional raconteur is a rare talent, and even celebrated diarists of the stature of Alan Clarke or Christopher Isherwood can be heavy going if read cover to cover. Literary triumphs recognise the average diary writer is nothing like these people; rather they prick, with considerable acuity, the pomposity of the English middle classes. In modern times we have the brilliance of Sue Townsend’s Adrian Mole, whose sense of his own self-importance is drolly sent-up in his teenage obsession with Malcolm Muggeridge. The Victorians, who certainly knew a thing or two about pomposity, had one Charles Pooter of the The Laurels, Brickfield Terrace, Holloway. The creation of George and Weedon Grossmith, Pooter is a character that grew larger than the book that contained him (a fact that would have pleased him greatly if he didn’t stop to find out why). To be ‘Pooterish’ is to have a vastly inflated sense of one’s own importance and to take oneself far too seriously. In today’s world of internet blogs, Twitter feeds and Facebook sharing, it is a word that has more relevance than ever before (and yes, Civilian Theatre recognises that ‘glass houses’ and ‘stones’ comes to mind here). Rough Haired Pointer has taken on the difficult task of adapting the wonderful comic novel, The Diary of a Nobody – the lasting chronicle of Charles Pooter, his family, friends and servants. 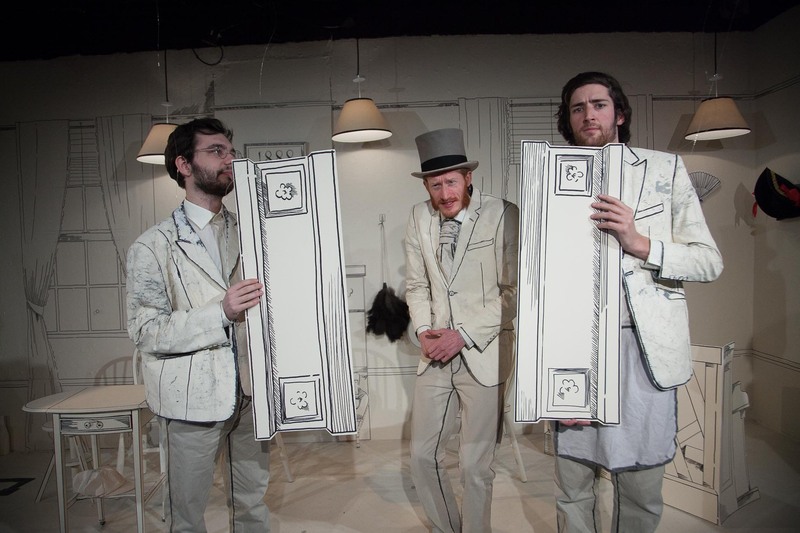 They do so with energetic vigour and considerable panache, as four actors take it upon themselves to play 45 characters across 100 minutes in a space with nowhere near enough room to swing a cat. Dramatising a diary is a problematic task as it means opening out an interior monologue into more traditional conversational dialogue; the result is that the very singular view of the narrator is threatened by audiences beginning to see Pooter as other characters see him, rather than solely through his own reflections. In order for the production to work we must continue to recognise Pooter as the self-important bore that you would try to avoid sitting next to at a dinner party whilst finding a way to empathise with the trials and tribulations he must endure, even if they are usually self-imposed. Luckily the committed cast is well supported by Mary Franklin’s perceptive adaptation. It has been a long time since I read the original but it immediately felt familiar and captured the rhythms of life in the Pooter household. Franklin has sensibly built the play around Pooter, his wife Carrie, his son Lupin and his maid Sarah, rather than trying to draw to many characters in detail. Each members of the cast has a focal point and other characters come into view as a succession of thumbnail sketches. All the cast members demonstrates a fine comic touch, and the play maintains a consistently high gag rate. 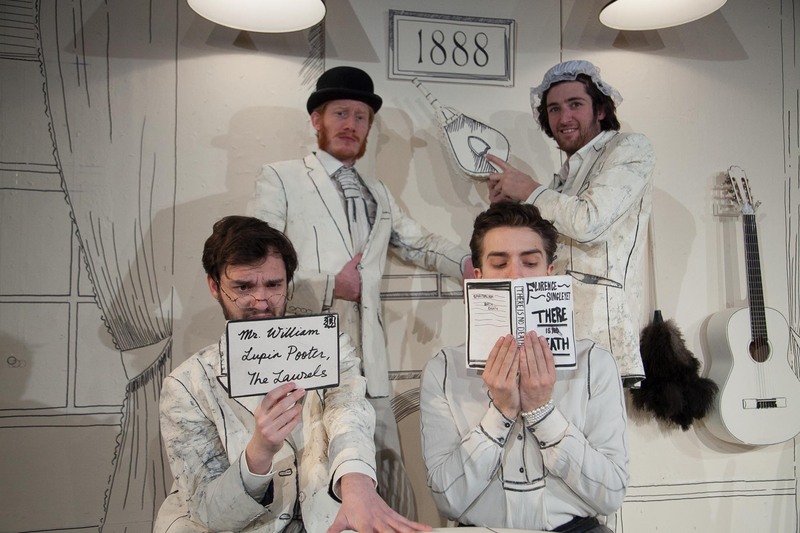 One hundred minutes is a long time to run a comedy without an interval but they work hard to sustain momentum and whilst one or two scenes could probably be omitted the sheer rapidity of farcical events means the audience barely has time to draw breathe before the next punchline arrives. For fans of the novel it is worth noting that it is played closer to a broad farce that a faithful attempt to recreate the atmosphere of the original. As a result it lacks what I found to be the hint of sadness, the frustrations of the perpetually thwarted, which lay behind Pooter’s total lack of self-awareness. This is perhaps the result of Jake Curran being such a likeable stage presence. He looks perfect in the role and feels Pooterish but he doesn’t really feel like the Grossmith’s Pooter. Curran has a very strong dynamic with Jordan Mallory-Skinner, who plays his wife. Mallory-Skinner is excellent in the role. It is a rather strange performance as it is performed entirely straight, without any attempt to hint that it is anything other than a man playing a woman yet it is curiously feminine and they convey a real sense of a loving couple. Particularly well captured is the shared love for Pooter’s terrible jokes and the hint of a private life that exists beyond the confines of Pooter’s diary. Curren and Mallory-Skinner form the glue that holds the production together. The freedom to provide carte blanche comic distraction is left to George Fouracres and Geordie Wright. Tasks they endeavour to carry out with some relish and much success. At time the frenetic nature of the play can lead to rather confused transitions and characters becoming hard to delineate. There were touches of The Play That Goes Wrong with an array of pratfalls, ad-libs and increasingly demolished scenery added into the mix. Whilst I don’t think it was all entirely successful it was probably a necessary to give the play a dramatic impetus that a straight adaptation might have lacked. The final comment is on the wonderful set and costume design by Karina Nakaninsky (recreated for this revival by Christopher Hone). The stark white and black lines are surely meant to look back to rhe original Punch cartoons and give the production the strange effect of watching a 2-d cartoon springing into life. It was a lovely nod to the novel’s origins. 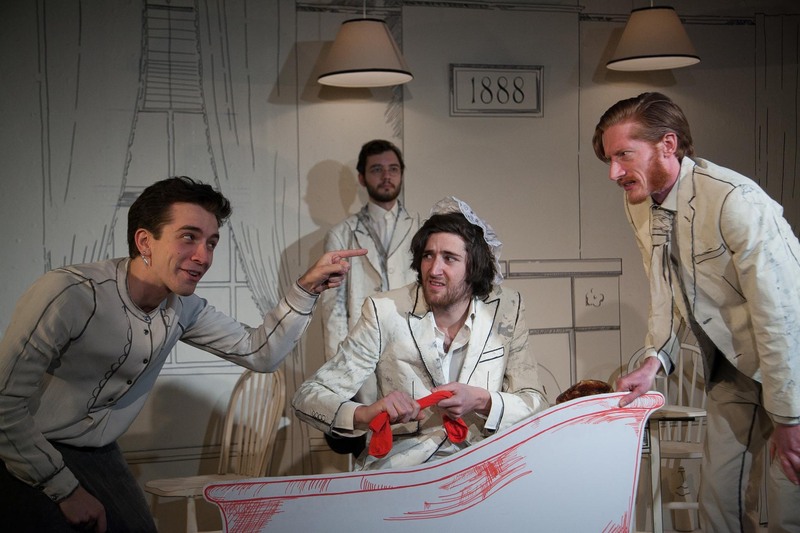 The Diary of a Nobody is an impressive opening to the King’s Head new season and is the theatrical equivalent of settling in with a favourite PG Wodehouse story. Perfect for January.